« Have You Had Enough Yet? A friend sent this phrase to me recently. I found this to be true on many levels. It is natural for your mind to wander to those within your inner circle that you care for. Sometimes your mind wanders to problems that you are facing. More often than not the problems that are on your mind are impacting people or situations that are near and dear your heart. If you are like me, your mind may also wander beyond your immediate circumstance. You may find your mind wandering to social or global issues. There may be a form of injustice that touches your heart deeply. Somehow this topic speaks to your heart in ways that can not be articulated. For many years I have been responding to my heart’s call. Striving to take action and do more for my local and global community. I have been running events, working one on one with people, participating in educational documentaries and film screenings, sponsoring impoverished children in the third world, traveling around the globe to witness and educate myself about what is going on beyond my back yard. To anyone else, my motivations are invisible, but to me, they run through my veins and fuel every decision, every movement and every breath. Paying attention to the heart’s call will fulfill you in ways that nothing else can. 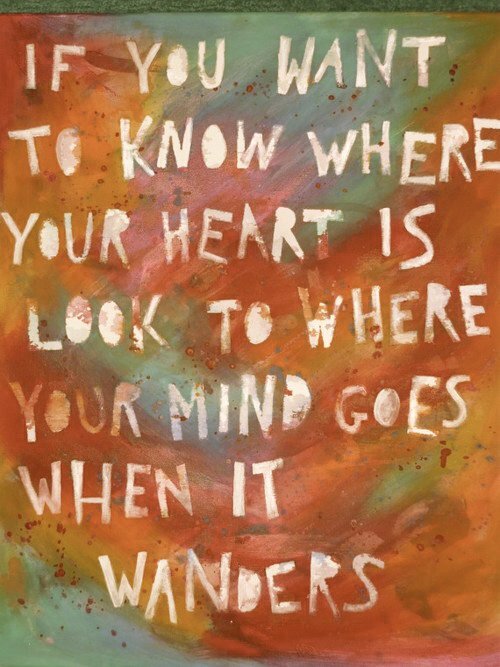 Where does your mind go when it wanders?